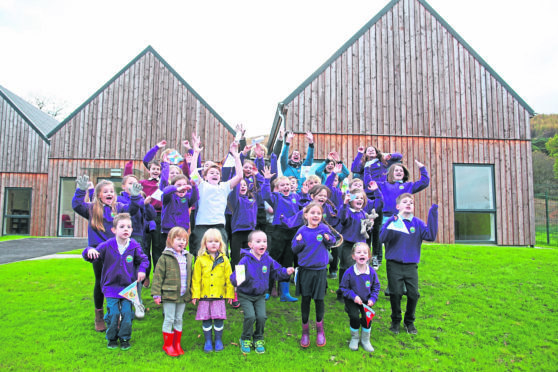 The Strontian Primary School celebrate moving into their new community-built school. It is believed the enterprise is the first of its kind in Scotland. The paths of Strontian were lined with former pupils and residents as primary-school-aged children walked between the two schools for the first day in the new premises. The honour of the ribbon cutting ceremony went to the school’s youngest pupil Fionn Togher, the school’s primary one pupil. He had watched the school being built, while he attended nursery. Earlier in the morning there was a procession of 32 pupils and teachers led by Ardnamurchan piper Iain Michie, and headteacher Pamela Hill. They walked the schools pupils from the old 1970-built school to the new building that sits near Ardnamurchan High School. Pupils had made flags to celebrate the occasion. Pupils and staff at the nearby Ardnamurchan High School vacated lessons for the early part of the morning to wave primary school pupils into their new classrooms. The building cost £900,000, and was built after Highland Council had proposed making improvements to the old school, before the community took it upon themselves to finance their own school building. If the school is no longer needed in the future, the building has been designed in such a way it can be converted into affordable homes. The construction of the new primary was completed in August. Highland Council accepted ownership of the building some weeks claiming a number of snags with the building had held back the official handover of the building. Highland Council has been advertising for a headteacher for the school, after the current post holder leaves in the next week or so. The closing date for the position has passed, and it is understood that interviews for the post will now take place.